When you first decided to study Indian call centers, what questions did you want to explore and how did the fieldwork change your focus? This is a good, if difficult, question about how one settles on a topic of research while ignoring many other, equally compelling, topics. My interest in India’s call centers stemmed from my first, rather unanticipated, encounter with a call center in early 2000. I was doing research on India’s software industry for my first book, Virtual Migration, and had driven from New Delhi to Gurgaon to interview a software firm’s senior manager. While being led to his office, I was struck by a rather odd and curious sight: the 1st floor office and all its cubicles were completely empty. I couldn’t help asking the manager about the absence of employees in his workplace. “Oh, they will start coming in at six in the evening,’ he answered casually. He explained that the empty part of the workplace that I saw was a call center, and workers were expected in the evening to start working during American office hours. Let’s remember that during their infancy call centers were often housed inside software firms. Some of the questions that arose in my mind were about exploring the consequences of global integrations; for example, how real-time connections across the world disconnected a set of employees from their own time zone. Let me admit, however, that the actual plan to do an institutional ethnography of call centers materialized after a conversation with Akhil Gupta in 2004 at Stanford where I taught at the time. The question how fieldwork changed my focus is an interesting one. Compared to 1999-2000, I found that the Indian firms had become much more secretive in 2004-05. To enter a premise, one had to swipe their ID, or, in my case, wait outside while the guard gets a nod from the reception to let me in for an appointment. Although it was still relatively easy to interview call center agents outside the premises, higher level managers were declining interview requests at a greater frequency. This lack of access inside the firm was one of the reasons why I ended up applying for jobs in call centers and working in one of them for several months. And, then, I began to realize that most of my previous interviews were as concealing of the work as they were revealing. Agents and managers tended to offer a more sanguine view of their work in interviews. But when I worked alongside they were more forthcoming. So, working at a call center not only allowed me a closer observation of the place; it also allowed people to be more revealing of their feelings and sentiments. In this book, you talk about a number of forms of neutrality demanded by globalized market relationships – neutral accents, gender neutrality, temporal neutrality, economic neutrality, and you trace in compelling detail how much labor is required to produce neutrality, which you define as an “indifference to difference.” (p. 116) What are the social costs of neutrality, and do you see this book as an argument against neutrality? You put it elegantly; this book can indeed be considered an argument against neutrality. I use the analogy of the alarm clock to bring out the dissonance one feels when confronted with neutrality. When the alarm goes off during the deepest sleep phase, the indifference of our schedule to our intimate bodily existence is experienced as deeply unpleasant. No wonder every alarm clock comes with a snooze button. It becomes clear that the clock was invented not for the person but for the schedules generated by modern institutions that were systemically neutral to the body. This experience of constant dissonance has become emblematic of our era as we juggle pressures from differentiated domains that may be at cross purposes with each other and neutral to the interiority of our lives. Call centers, where the diurnal body of the agent performs nocturnal work, may be a jarring representation of our 24-hour global economy. As we know now, some of their attributes — like non-standard work schedules, rotating shifts and night work—are becoming routine aspects of work in the United States. It is not surprising that prescriptions and over-the-counter drugs for sleep disorders have skyrocketed in the past decade. I have tried to show how experiences of disconnections are directly linked to practices of connections, and how the very drive to functional integration produces specific dysfunctions. These paradoxes are easier to spot and study in India’s call centers, as they play out in the lives of call center agents and increasingly, I argue, in our own lives in the global North. Certain modes of language, labor and life now appear as obstacles to the projects of integration, and thus, must be whittled away. One of the themes of your book is exploring how difficult it is to carry out even ordinary conversations when you don’t share the same cultural or geographical points of reference. Yet over time the Indian call workers develop quite complex, albeit limited, understandings of the social worlds of the people they are calling. Your book offers a fascinating glimpse into what you know of a country if you are working in a call center far away. Could you talk about what an Indian call worker knows about what it means to be American just from calling Americans for hours a night for months or even years, and if it matters whether the task is debt collection or telemarketing. That is, did the nature of the call shape what they know? Perhaps a call center agent knows a little more about Americans than, say, her neighbor who has never been to the U.S. But most of this knowledge is scripted and acquired by training. But your question is right on the mark about the call shaping the agent’s perception. On the floor, by actually talking with Americans in real time, they do end up learning a little more about their customers, for instance, their sense of humor, cultural norms of conversation, racial biases, and other subtle dispositions that would not be available to someone who has never talked with an American. Some of their observations even took me by surprise; for example, most of them said that Americans were more rude than British or Australian people who also received roughly the same number of telemarketing calls. This was at odds with my first experiences in America more than two decades ago when I found people in public places a lot more polite than people back in India. I haven’t seen people saying “hello” or smiling on a sidewalk in India or Europe as we do in America. I thought the reason for rudeness must be the call itself. If an American receives a cold call during their private family time, their reaction—we can expect—would be quite negative. This sheds light on the cultural importance of privacy, which appears to be higher in the U.S. than in Britain. But this example also shows that the agent could come to wrong conclusions based solely on their calling experiences. All of us always construct the other for our own comprehension, and cannot see beyond our own cultural frameworks and available perceptual data and apparatus. Call center agents often constructed Americans as wealthy, honest, and rude, and given their limited context, they can be justified in their assessment even if it doesn’t correspond with the views of the visitors or residents in America. You discuss a notion of algocracy – rule by algorithm – and as you develop this idea, you contrast it primarily to bureaucracy. I was wondering if you could say a little bit about how people in your fieldwork experienced the difference between operating within an algocracy and operating within a bureaucracy. What are the lived differences for people on the ground between algocracy and bureaucracy? In 1999 when I was researching software firms in India I was struck by the fact that so much of software that we used was not developed at one place. Most of it was developed in several places at once. Different teams sitting in different continents were often contributing to the same project. I was aware of the literature on organizations where the advent of a middle managerial layer to coordinate the activities of large bureaucracies was crucial. But in the case of global software development, it was not possible to have a middle managerial layer coordinating different teams working under different labor regimes in different countries. Sitting at a firm one day and watching the work screen of a programmer, I realized that it was the code itself that was the manager. There were so many access controls built into the software platform that there was no need for a human manager. In 1998 in graduate school I had written and later presented a paper on what I called hyper-bureaucracy at the time. But during fieldwork in ‘99 it became clearer how code itself was the organization. For the lack of a better term, I coined the term algocracy, rule of the code or algorithm, instead of the bureau or office. While deeply Weberian, the concept is quite different from the notion of bureaucracy, which was defined by Weber through such features as hierarchy, documentation, dominance of positions as opposed to persons. Bureaucratic rules always needed to be internalized by the person following them. Whether I was eligible for a particular bank withdrawal used to be decided by the person at the bank who was supposed to know the rules and conditions of eligibility. The person had to be mobilized for bureaucratic norms to be effective. But the algocratic system structures the possible field of operations without requiring the person to internalize its norms for performance. Embedded algorithms would deny or allow a withdrawal request online without requiring anyone to internalize the rules. While bureaucracies use action orientation, algocracies govern through action consequences. We don’t know Google’s or Facebook’s algorithms even as they structure our possible field of action. This is true of identities as well. Our financial identities (e.g., credit scores), medical identities, shopping identities—or what I call system identities—are all algorithmically constructed by different systems without our approval or involvement. In recent years I have been happy to see so many studies and conferences on the importance of algorithms for social life. Conclusions can often be difficult to write, I am struggling with writing one right now. Could you talk a little bit about your writing process for your conclusion? Conclusions are difficult to write for me as well. After completing the main body of a manuscript, I tend to run out of steam, and the idea of summarizing the manuscript’s insights and findings seems daunting. This is the reason why I don’t really write conclusions. Perhaps I shouldn’t be divulging the banality of my writing habits but here is what I have found myself doing over the years. I start a separate section where I keep depositing numerous pieces of texts that I couldn’t use in the main body for some reason or the other. At the end I cobble together a conclusion from those scattered, unused, unloved (by peers) fragments of writing. A. Aneesh is currently an Associate Professor of Sociology and Global Studies at the University of Wisconsin, Milwaukee. 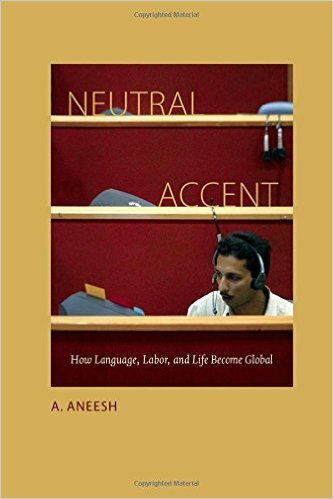 Neutral Accent: How Language, Labor, and Life Become Global is available through Duke University Press, 2015. Deeply philosophical issues are elegantly brought out in this interview. It made me think deeper into the factors of globalization and how it will, for good or worse, alter episteme that presently define our realities.